It's HOT. I get red faced within minutes of running outside and have learned to appreciate the treadmill a few times a week. If you are training in the summer heat, be sure to wear the appropriate running gear up so you do not get overheated. Light colors and moisture wicking materials are key. I am loving ASICS new line of running apparel, especially the outfit below. In May, I switched up my marathon training plan for the Dublin Marathon. So far, I am thrilled with the transition and strongly suggest the MY ASICS app to any runner. You can use this FREE app to train for any distance - a 5K to a Marathon. 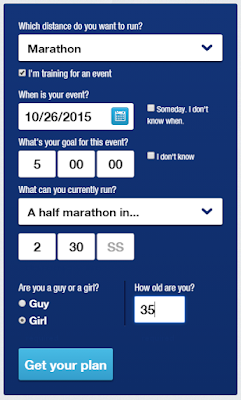 It is simple to use and will calculate a plan for you based on your gender, age and running history. Say you want to run a sub 5:00 marathon and can currently run a 2:30 half marathon. You put that information in, along with your race day and you will receive a training plan. Structure your training - Maximize training results by running the right distance at the right pace on the right day. Build your capacity - Gradually increase your anaerobic threshold with each run by matching running pace to your current level. Focus your goals - Set measurable goals and track your progress towards them with performance forecasting. There are 6 key phrases to build the running skills, helping you reach your goal. Preconditioning, Getting Faster, Going Further, Race Simulation, Tapering & Race Day, Recovery. Honestly, with the heat we are having in FL right now and knowing it will only get hotter as the months go on, I am fine with taking more walk breaks. Even with extended walk breaks, I am unable to run at the pace suggested for my 3 mile jog days. Those days will be faster than suggested. One thing that I found interesting about this plan is that I don't have any double digit runs until August. Given the summer heat, I am perfectly fine with this. The MY ASICS methodology was refined by training thousands of runners at ASICS Institute of Sports Science. The thing I love most about the plan - it's not redundant. I am not going to be running on the same day each week. With my former training plan, I would dread certain days, knowing well in advance they were long run days. You are able to sync your training plan to your phones calendar, to help remind you what miles to run each day. You can also sign up to receive emails from ASICS, reminding you to run. 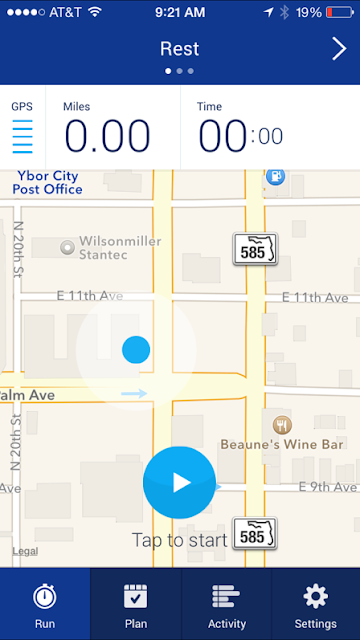 Once you are ready to run, you hit the start button on your app's page. Today is a rest day for me, so the screen shot notes Rest. If today were a scheduled run day, it would have my miles and pace up top. You can also choose to run a Steady Pace or 1 mile splits for speed work. My longest run in June is 8.5 miles on the 21st. This is good timing as that is the Sunday following Cupcake Lovers Weekend at Hilton Bonnet Creek and I am quite certain I will have some calories to run off.